This is a powerful book, and also a very sad one. I run a Computer Lab, we offer free classes, and we offer free internet access. It is based in a large homeless shelter, probably the largest shelter in North America, we offer beds to over 1,100 people every night. Who are these people? Well some recent surveys show that approximately 1/3 are addicts, booze, drugs, or gambling. Another 1/3 suffer from some kind of mental health issue, and the vast majority of all of the people involved have some kind of anti social tendencies. I was intrigued by Eileen DeClemente’s book, it hit close to home. Yesterday, I had a client go into seizure in the lab, while it is not an everyday occurrence, it is not something that is rare. The first time I witnessed a seizure I was horrified. The brain short circuits, the victim literally freezes, crashes to the floor, and often twitches and convulses. It is not a pretty sight. 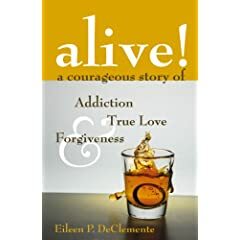 In Alive!A Courageous Story Of Addiction, True Love, and Forgiveness Eileen DeClemente tells her life story of addiction and recovery. It is not a pretty story. Eileen started with booze at the tender age of 11, as an adult she added prescription drugs, and street drugs. At one point her daily intake was in the region of 90 pills, a bottle vodka, and a couple of cases of beer. The problem is, the more you do, the harder it is to get the high, and Eileen was the expert. The highs became less and less, in fact the highs went away, she needed to “use” just to maintain. Eventually Eileen, as every addict does, crashed hard. One last seizure, one last abuse of her position as mother and wife, and one last realization that she had taken the wrong path. Recovery is not easy, physical dependency creates physical and mental problems. We glibly refer to ‘withdrawal symptoms’, they are not just symptoms, they are facts, they are a bone crushing reality. It is estimated that 30% of people living in the US either are addicts, or know an addict. Alive! should be on every high schools reading curriculum, it reveals the story from the inside out. Eileen was one of the lucky ones, at age 34 she woke up, but years of addiction have taken their toll. She is now 55 and diagnosed with Alzheimer’s, and she freely admits that it is likely a result of her addictions. This is a book that I plan on recommending to my co-workers, and a book that I recommend everyone should read. You can get your own copy from Amazon, and you can also get more information from Eileen’s web site. 1 user commented in " Book Review: Alive! by Eileen P. DeClemente "